University of Wisconsin hosted an indoor meet Saturday, Jan 25, 2014. Angela Boushea, a junior at UW, won the Weight Throw competition with a throw of 62'11.5" a throw that ranks her 2nd in the Big Ten Conference. 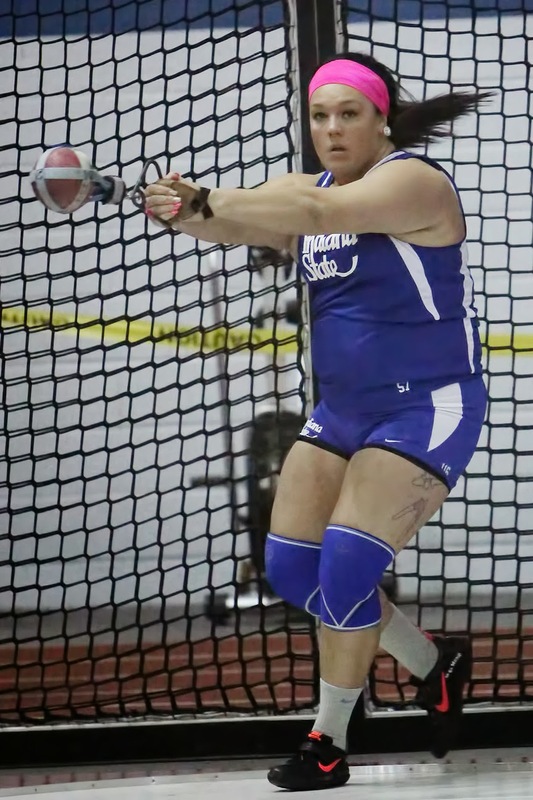 Mary Theisen, a senior at Indiana State, won the Shot Put with a new P.R. 56'00". Theisen's throw ranks her 3rd in the women's shot put in the nation. 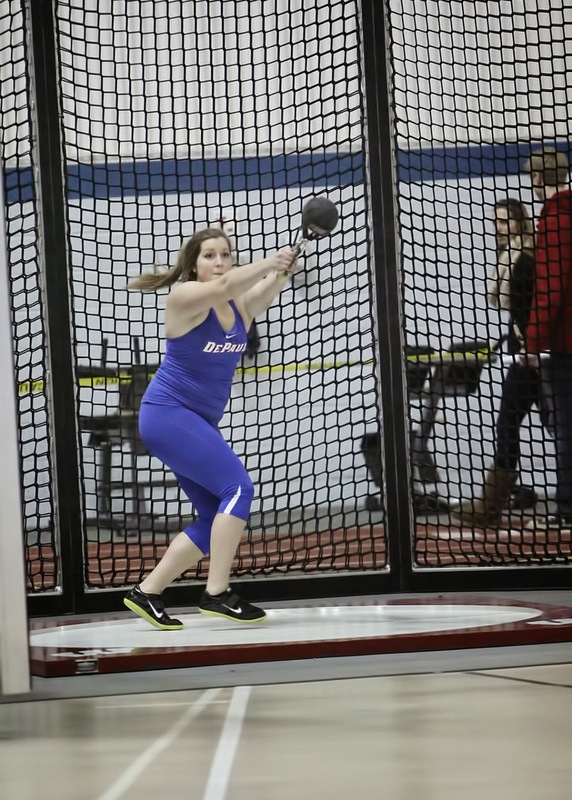 Corinne Franz, a freshman at Depaul, P.R.d in the weight throw. It was so fun to watch these women compete! University of Minnesota hosted a meet Saturday, Jan 18, 2014 that saw several MTC alumni compete against one another. The Shot Put saw 3 MTC athletes finish in the top 7. KeKe Burks broke her own North Dakota Record in the weight throw again, great way to start the season. The UW Badgers hosted a duel meet vs Missouri that had 3 more MTC alumni compete. Andrew Brekke took 3rd in the men's Weight Throw won the shot put, while Angela Boushea took 2nd on in the weight throw and 4th in the shot put on women's side. In the Friday night open meet Riley Budde won both the weight throw and shot put with great throws for his first collegiate meet. Congrats to the many MTC throwers competing in college who had great performances in their first meet of the indoor season. Lots of great throws. Can't wait to see how far you'll go in February and March. Good Luck on finals and enjoy your break. KeKe Burks - University of North Dakota - breaks the school record in the WEIGHT THROW. 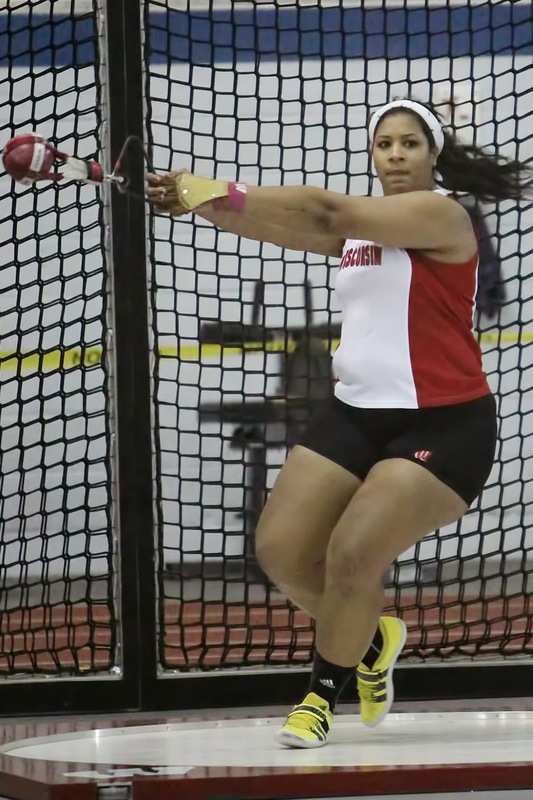 As the NCAA indoor season begins for many schools this weekend, I wanted to wish all the best to the Madison Throws Club throwers competing in college. Months and years of preparation have gotten you to this point. The waiting is nearly over, when that first meet begins, do your thing, you are ready! This season make sure you learn from your successes as well as your disappointments, both offer valuable lessons that can make you better. Its a long season, build on each meet so that you can throw your best when it means the most to you and your team. GOOD LUCK! To all of MTC's college throwers. Where does Madison Throws Club meet? The outdoor throwing area is at the south end of the stadium along Mineral Point Rd. Indoor sessions are held in the fieldhouse. Park on the north side of the school in between Memorial High School and Jefferson Middle School. Enter the doors marked Fieldhouse Entrance. Madison Throws Club had a simple beginning, we started in 2002 when a few Madison Memorial throwers asked Coach Frontier if they could throw more in the summer. Since then MTC has grown to help hundreds of track and field throwers from Wisconsin, Illinois, Minnesota and Michigan each year. With the help of many of the best coaches in the Midwest MTC athletes have gone on to win Conference and State Championships, set school and state records, compete at the national level, and continue on to have great success at the college level. Improve athletes in the throwing events in the state of Wisconsin and beyond by offering high quality coaching and instruction.